It’s the most wonderful time of the year! America’s Got Talent is back Season 13! 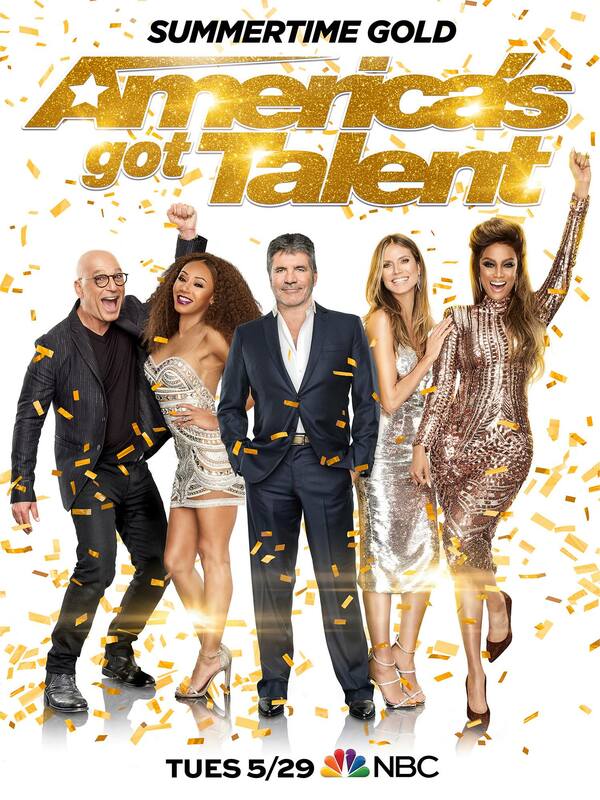 Judges Simon Cowell, Heidi Klum, Mel B, and Howie Mandel return to the AGT judges table to find the next big act in America. Which Season 13 act will join Bianca Ryan, Terry Fator, Kenichi Ebina, Mat Franco, Grace VanderWaal, and Darci Lynne Farmer in the AGT winners’ circle? Read on to find out! Savitsky Cats had the honor of kicking off Season 13. These feline phenoms performed some of the memorable tricks that we have seen from past acts such as Season Seven champions Olate Dogs. It was cute, but was it worth $1 million and a headlining show in Las Vegas? Probably now, but they received a standing ovation from Simon and the ladies. They won the first unanimous four Yeses of the season. Magician Shin Lim brought host Tyra Banks onstage for his Judges’ Audition. Shin asked Tyra to pick out a random card. After drawing the Queen of Spades, he asked her to autograph the card. He put the Queen of Spades in the deck and it magically appeared at the front. He rubbed the card on his chest, leaving a blank card. Suddenly, it appeared in thin air. As the auditioned continued, Shin transported Tyra’s autographed card into his hand while leaving the fashion mogul with the blank card and transfiguring it into a glass box. While we have seen magicians such as Mat Franco, Piff the Magic Dragon, and Jon Dorenbos use cards in their acts, Shin elevated the card trick to a whole new level of excellence. He received a standing ovation from the judges and Shin advanced to the next round. Sibling band We Three gave me chills. Their original song was dedicated to their mother who passed away from cancer. This was a very personal song, and they delivered a spectacular first impression. Mel B wept during the performance and stated that she lost her father to cancer a year ago and said she connect with them. Loved that the show incorporated Sons of Serendip’s “Don’t You Worry Child” as they left the stage. Comedy group Human Fountains delivered a hysterical audition that showcased their intriguing talent: spitting out water to “My Heart Will Go On.” Howie and Mel B laughed out loud and gave them a standing ovation. Meanwhile, Simon called the act stupid and buzzed. However, Howie and the ladies overruled him and they advanced them to the next round. Dance crew Junior New System came all the way from the Philippines to audition for the judges. I loved their choreography, and the golden heels that they might have stolen from RuPaul’s Drag Race workroom made the act memorable. I would put them on the same level as Season 11 standouts Malevo and Season 12’s Just Jerk. Junior New System received the coveted four yeses they needed to advance to the Judges’ Cuts. 14-year-old rapper Flau’jae was the next act to face the judges. The Savannah, Georgia native got into rapping to honor her deceased father. Flau’jae revealed that she grew up without knowing her father because he died before she was born. She delivered a powerful performance of “Guns Down,” an original track that dealt with the consequences of gun violence. While AGT had rappers in the past such as Vivian “Rapping Granny” Smallwood and Tone the Chiefrocca, they were seen as comical acts. I could see Flau’jae be a real contender to make it to the Season 13 finale if she makes it past Judges’ Cuts. Comedian Vicki Barbolak spent 20 years in the stand-up world. In her monologue, she talked about Elon Musk, bras, and her court-ordered therapy sessions. Howie declared that Vicki filled the void that Joan Rivers left behind and Simon added that people would relate to her. I also agree with Simon; she is going to be a star! The final audition of the Season 13 premiere belonged to Austria-based acrobatic dance troupe Zurcaroh. Their choreography made my jaw drop. I was so impressed with their stunts and precision as they moved across the Pasadena Civic Center stage. I felt like I was watching a scene from a Las Vegas blockbuster. All four judges gave them a standing ovation, and they received Tyra Banks’ second Golden Buzzer of the series!!! I believe that this troupe will dance all the way into the finale! Next week, the Season 13 Auditions continue!